The Department of Higher Education DHE is providing the different scholarship schemes for the Haryana state students in the collaboration with Haryana state, DHE Provides schlorship to the students who are financially poor and minority people in the state of Haryana, backward casts named as OBC, SC, ST and etc, DHE Haryana Pre and Post Matric scholarship 2018 application will be available at official website of Department of Higher Education, under this scheme many students are benefited through this scheme, Students who are economically poor and having excellent academic background can apply for DHE Haryana Scholarship 2018 scheme, Many students have applied for Pre and Post matric scholarship from online in DHE Haryana official website. The applied candidates have to check the DHE Haryana Scholarship Status 2018 regularly for further updates form State Government of Haryana, As government has released the scholarship for students so they should ensure that did they have got the amount in their accounts or not. The candidate college Fee will be sent to the students respective college account. The under graduate and post graduate student can check DHE Haryana Pre and Post matric scholarship status online from the official website of DHE Haryana. Important Note: Candidate who are appearing in Common entrance test CET conducted by Haryana government will have a chance to get good college depending on their ranks. here we are providing some steps to check DHE Haryana Pre and Post matric scholarship status, The students who are applied for SHE haryana scholarship have to check status of haryana scholarship application status at official website of Department of Higher Education Haryana, The undergraduate and postgraduate Fresh and renewal students will be getting the stipend to their account and these details need to be check by students regularly.Follow the below Haryana Scholarship 2018 status Check procedure for checking the application status online 2018. First of all open http://www.highereduhry.com URL, after opening the given URL home page of Haryana DHE will be opened. after opening home page of DHE haryana, then click on login button at top corner of DHE portal. Then enter the Login id and Password that was generated while filling application form. The select the ‘’Application status check’’ link after login with ID and password’s. Then your application status will be displayed bottom of the page. Note: Do not forget your ID and password because your login Id and password must be correct to check the application status for haryana Schlorship 2018. That’s it just follow the above process to check status of haryana Scholarship 2018. 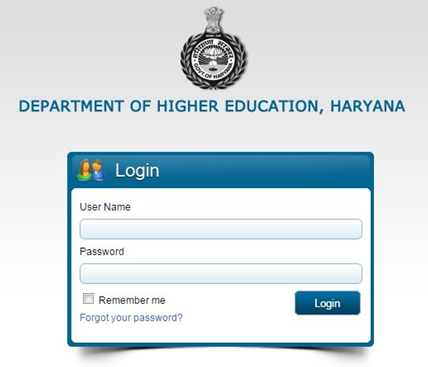 Both the fresh and Renewal Pre and Post matric students can their application status form same way.DHE Haryana Pre and Post matric scholarship status online from the official website of DHE Haryana. Just follow the above procedure clearly and enter your Login id and Password correct. When your applied for DHE scholarship shames you will be generated with Login id and password which need to be entered here for future login. Also, make sure that your application is being proceeded by the state government and amount has been delivered to the college account.